The Laws of Money are essential truths. They will propel you to take all the necessary actions you need to take with your money. Suze Orman, America's most trusted personal finance expert, gives you the guidance that will point you in the right direction every time you need to make a decision about your money. Like a compass, the laws of money directs you to safety, security, and prosperity. They give you the ability to define your financial destiny and guide it with your own hands, so you can hold on to what you have and create what you deserve. These laws are as timeless as they are timely. The Laws of Money, The Lessons of Life provides you with the solid financial foundation upon which you can stand, regroup, and build. Law Number 1. Truth Creates Money, Lies Destroy It. Law Number 2. Look at What You Have, Not at What You Had. Law Number 3. Do What Is Right for You, Before You Do What Is Right for Your Money. Law Number 4. Invest in the Known Before the Unknown. Law Number 5. Always Remember: Money Has No Power of Its Own. Easy to listen to and more interesting then you would think. 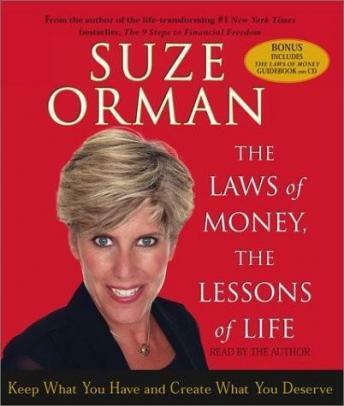 Suzie tells stories about situation, so the book isnt just dry financial advice. CD also comes with a printable notes which I found to be a nice touch. This was a good read. Suze illustrated principles about money that you would not expect. But believe me once you hear them and apply them it will make a difference. I have been such a financial slacker and after listening to this book it made me get out all my statements and determine just how much I was in debt. Suze's insight will help me set goals to eliminate this debt. Her stories helped to illustrate her points very well. Recommended. I like that Suze reads her own books, wish more authors would do the same. The book is overall good. She does tend to talk to you like a second grader, but overall she gives good information on various subjects about dealing with money. I was enticed more in the beginning when she talked briefly about hitting rock bottom. You could probably get away with just the first part and won't feel like you missed anything. I had read this 15 years ago........sigh.......but as Suze says "don't dwell on the past". Good practical advice in an entertaining format. I wasn't bored and really listened all the way through. I would recommend it for good practical money advice. i like it so much that i kept it another week. so far i like your company because you have the cd option of reg to mp13 which at the present time i don't have. I got a lot of new useful information from this book, as well as confirmation that some of the things I was already doing with my money were in fact good choices. I really enjoyed listening to this.